I’ve been a Washington Capitals fan for all forty-one years of their existence. During that time, I’ve watched other NHL teams possess what it takes to win at the highest level while the Capitals for one reason or another have not. Now, for the first time, I’m watching the Capitals do to other teams what they’ve been doing to us in a million little ways for what seems a million long years, and I can’t believe my eyes. Here’s how Washington attacks opponents, 2015-16 style. Throwing Braden Holtby at them near every night, arguably the best goalie in the game; playing mistake-free hockey like they’ve never displayed before; having great team depth from top to bottom; grabbing a lead and holding it – toying with the opposition when a lead’s actually lost, then winning convincingly in the end; having player trades pay off – finally; hurling a combination of youth, prime-age players and experienced Stanley Cup-winning journeymen in the lineup. Oh, and throwing Alex Ovechkin at them, the best player in hockey right now. Things are looking up. So what’s brought all this about? Two years ago this summer, the Caps ousted nineteen-year general manager George McPhee and coach Adam Oates for Brian MacLellan and Barry Trotz respectively. MacLellan outed some old guard players and replaced them with solid talent through wise player trades and pick-ups. Trotz has combined just the right blend of no-nonsense coaching, consistency and effective talent assessment to produce at least three great lines nearly every game. For the first time since their inaugural 1974-75 season, all things are coming together: GM, coach, players – not to mention important intangibles like player chemistry, luck and perhaps even fate. They’ve never had all these ingredients at one time before. Why? Just look at their history. Early Capitals squads played hard, only to be left downtrodden for their efforts. The NHL awarded Washington an expansion team, one named after the Washington Capitol, the nation’s symbol for enduring stability and strength. Just a kid starting college then and anxious to see NHL hockey in the newly constructed Capital Centre sports arena, I volunteered to be a statistician for the Capitals game night staff. I wound up seeing close to 400 NHL games from the press box as statistician during Washington’s first eight seasons. Only a hopeful, exuberant boy of a man could endure what he was about to witness during the forthcoming era. Hard-working, hungry, and interesting to say the least, the Capitals’ players were cast offs from other teams. The eight Caps squads during this era failed to post one playoff game. Often, rosters were so depleted, above average players rose to savior status quickly. As for all others, frustrations ran deep. (I’ll never forget a large color photo that hung in Capital Centre’s lobby. It was of Ace Bailey – wow, you mean the Ace Bailey who once played for the Boston Bruins!? – crouched on his knees, head bowed in anguish, holding half a smashed stick in his glove. It went without saying he shattered it out of frustration). Equally frustrated was owner Abe Pollin who announced not only that the organization had lost 21 million dollars so far but that changes had to be made immediately. Young David Poile became general manager and turned the franchise around. During his tenure, the Capitals made the playoffs fourteen years in a row, sending out great players like Rod Langway, Scott Stevens, Mike Gartner, Peter Bondra and Olie Kolzig. With the addition of Rod Langway in particular in 1982, the Capitals were suddenly feared. Just the look in Langway’s eyes scared opponents from entering the corners. Scott Stevens could hip check you two zones back to dreamland. Mike Gartner would skate past you and score all in one breath. Bondra could beat anybody with his offensive skills around the net. And Kolzig could stop near anybody from scoring. Even so, during this era, somebody else always halted the Capitals from getting beyond a first or second round of playoffs, reaching a third only once. New owner Ted Leonsis backed his general manager, George McPhee, for fourteen seasons. Their player acquisition style of trading players and draft picks for big name stars failed to work and swung the Capital pendulum backward from the Poile years. Under McPhee, the Capitals failed to make the playoffs five seasons. During the eight they did – spread out over several campaigns with a mishmash of coaches – Washington reached the second round of playoffs only three times. The Capitals seemed predictable, a franchise regularly constructed of choking teams. Trying Hall of Famer Adam Oates as coach in 2012 was a prayer to change things. But midway through his second year in 2014, his system fell apart. Players failed to respond. Fans grumbled. Even the Capitol Dome just down the road from Verizon Center was crumbling, necessitating the government to begin a huge repair project still in force today. But could the Capitals be repaired? Leonsis fired McPhee and replaced him with MacLellan who selected Barry Trotz as coach. Trotz immediately instilled a different attitude in the locker room, his first season marked by stability, a balanced system and ability to communicate and teach (especially Alex Ovechkin about how to play a 200 foot game), not to mention having solid defensemen – Matt Niskanen and Brooks Orpik – to work with, acquired in savvy MacLellan trades. During this current year’s campaign, MacLellan has added outstanding players, including T.J. Oshie and Justin Williams (even giving Mike Richards a comeback try. Why not?). Capitals spirit still lives on, now with new management, coach and players. My biggest concern, despite the vastly improved cast of defensemen, enforcers and elite passers skating alongside Alex Ovechkin, is how the Capitals rely on the Great Eight. He is key to their offense and power play. Without him, they don’t have the big threat great teams often possess to win championships. Very durable throughout his eleven-year career, Ovechkin’s missed only two games this season, but both were losses without him (combined 10-2 scores), and both to the Florida Panthers, my second biggest concern. The Panthers seem to have the Caps number (not to mention the Dallas Stars since ’08). However, other than a forthcoming trade deadline move for another solid defenseman, I’ll take my chances with this team as it is. To date, the Capitals hold an astounding 40-9-4 record – the next best team is eight points behind with twice as many losses. Since the league expanded from the original six teams in 1967-68, only the 79-80 Flyers have more points in a fifty-three game span. As a result, the Caps may very well wind up the NHL’s regular season top points leader, earning the league’s Presidents’ Trophy for the honor. But the Caps have won the NHL Presidents’ Trophy before, during the 2009-2010 season when, overconfident, they were embarrassed by Montreal in the first round of playoffs. The Presidents’ Trophy may be an honor, but this year’s team talks about the truest honor there is, hoisting the Stanley Cup. After all, isn’t that sport’s greatest payoff where, for one moment, a grown man acts like a boy again, embraces the world, hugs his teammates, jumps up and down, and hoists the biggest crown ever above his exhausted body, adorned in uniform that bears the logo he’s so proud of? If the Washington Capitals win the Cup this June, a boy’s dream will have come true. A franchise’s mission will have been fulfilled. Although foundations were tested, what we all shared – the franchise, it’s long-frustrated fans, and this boy dressed in mere writer’s garb – was a daily, never-ending foundation built on hope. And a few unanswered prayers. Pat Ribble and Caps celebrate a 1982 goal at Capital Centre’s east end. This writer and friend Paul Kane at Capital Center construction site nine years earlier. Capitals artwork and photography by Mike Andberg. Capital Centre construction photo by Paul Kane. Mike Andberg was born and raised in the Washington DC area and, although moving to Santa Fe, New Mexico, in 1996, has continued to follow all Washington teams closely, particularly the Capitals. There’s a hole in my heart only a puck can fill. Yes, I’m a hockey fan. A Washington Capitals hockey fan. I saw eighty regular season games on cable this year (well, most of them), all in hopes my Caps would make the Stanley Cup playoffs for only the second time in their forty-year history. Well, they made the playoffs. That’s where the hysteria began. Playoff madness takes over your mind, your life and you lose all perspective. 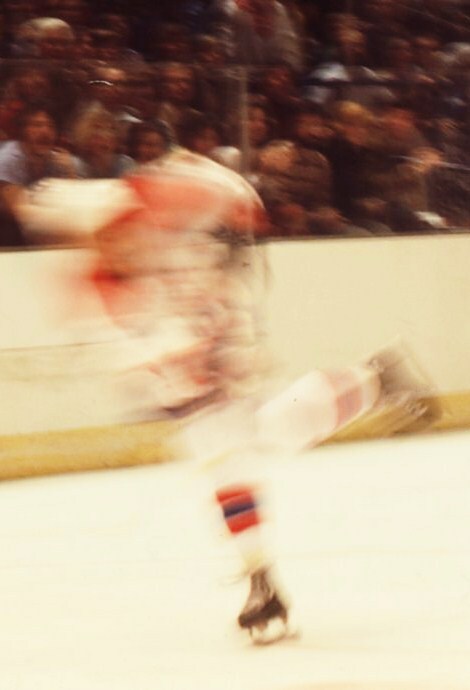 Time becomes a blur. For any avid fan, life’s goal changes from spending time with friends and loved ones to intimately following your team through all four playoff rounds (and a possible twenty-eight games over a sixty day period) just so you can watch your ice heroes hoist the Stanley Cup sometime in June. June, as in beautiful late spring, early summer. When the weather is nice to be outside again. When chores need to be done. Yards need to be tended. What, little Johnnie is six now? When did that happen? The worst part of the playoffs is pace: a game, a night off, another game, a night off – there’s practically no break until your team loses a best-of-seven round and is eliminated. I’m tired and the Caps only went two rounds this year. Think what it must be like to go to the finals. If you’re a Caps fan, it gets even worse. Their hockey MO is to stretch series to the seven game limit. They cannot win or lose in four – they love teasing you with 3-1 series leads, then blowing the next three games. Sometimes they blow the next two and pull out the seventh in overtime, having succeeded in wearing themselves out just to do it all over again for another series, then ask for more. They also love close games. There are no blow outs. They love overtime. They once played a playoff game into four overtimes, finally losing at 2 AM (I saw that one personally and stayed to the bitter end). This is very difficult on fans. Sleep patterns are disrupted. Eating times are often rearranged. Bad moods last for days. Weight is gained. Interest in other activities wanes. Actually, bad moods never end. Unless … (until) you win the Cup. Time now to clean the bathroom, refill prescriptions, vacuum, replace burned out light bulbs, refill the empty freezer case, take the snow shovel away from the front door, fix the front door lock, dust. No wonder I can’t wait for the first preseason game in September.